Like anyone who writes about the NBA, we use Basketball Reference multiple times a day. It's a bottomless resource of information about the NBA and the beloved Knicks, from All-Star appearances (Oakley in '94!) to uniform numbers (the Knicks have the worst set of players to wear Number 23) to all-time draft picks (hello Eric Chenowith!). One of the ways the site supports itself is through sponsored pages, where fans can pay to put their stamp on a player's particular page with words of support, wisdom or sarcasm. You can get a sense of how the die-hards really feel about a guy on these pages, so we couldn't help but take note when, in the season's first week, someone already had sponsored Landry Fields page. The koan? "The Force Is Strong With This One." If you weren't already a goggling Fields lover, after last night, you are. The Force is strong. The Knicks beat LeBron James and the Miami Heat 93–88 last night, their first win over a LeBron team since December 2007, and Fields was the primary reason why. He had his prettiest night of stat feeling in a couple of months, scoring nineteen points, grabbing thirteen rebounds and dishing out six assists, but stats never quite capture Fields. He was everywhere this game, ending up wherever the ball was, pestering both Dwyane Wade and LeBron James on defense and, of course, draining a clutch three in the final minute that sent the Garden into apoplexy. "Landry Fields was probably the player of the game," Miami coach Erik Spoelstra said. "That's a guy who survives on just making effort plays. And he's relentless with his effort, does all the little things." It was a Landry Fields night; the Heat machine was taken down by a second-round draft pick from Stanford. He's doing it with flair, too; this isn't the dull, plodding, workmanlike effort of a Shane Battier. We loved the way SLAM writer Adam Figman put it on Twitter: "Landry Fields' 'I know I just did something awesome but I'm finding a way to keep this wide-eyed humble face' steez is the best." 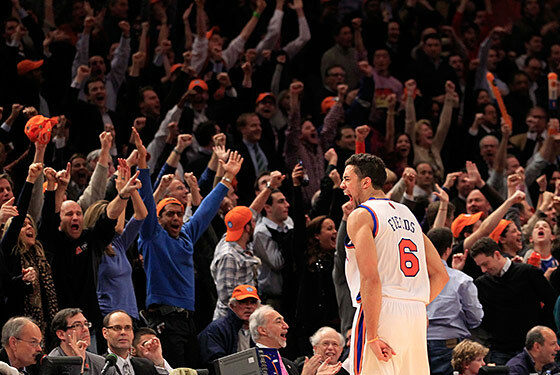 This guy owned the Garden last night. It helped that LeBron James had his worst game at MSG in years. Usually LeBron raises his already-considerable level for Knicks game, but he was off last night, going 7-for-24 from the field and dishing out just five assists. (Shawne Williams was surprisingly strong on defense against him.) The Heat are in the midst of another of their cold streaks right now — they've lost five of their last six — and they looked particularly out of sync last night. This is a team that still hasn't figured out an offense, which was understandable for a while, but now it's near the All-Star Break, and they continue to watch LeBron dribble for twenty seconds. We thought that's what he left Cleveland to avoid? But worry not about those Heat. Last night was one to celebrate the Knicks on a national stage, for them to show off that they can play defense, that the Garden can still shake, that they can beat a title contender without Carmelo Anthony, that this is a playoff team that, whether or not they can win a postseason series, certainly is no rollover come April. Mostly, though: We're just happy the world saw Landry Fields, this ridiculous kid who makes every game at least 33 percent more fun. The Heat don't have a guy like Fields, and they desperately need one. Spike Lee's wearing his jersey, MSG is chanting his name, and the Knicks are beating the hated Heat for the whole world to see. The force is strong with this one.